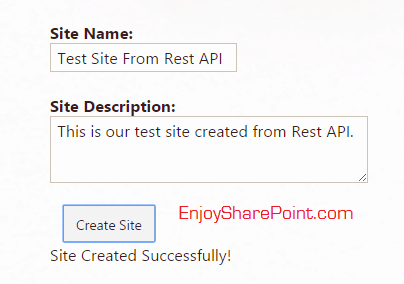 In this post, we will discuss how we can create a SharePoint site using Rest API in SharePoint Online Office 365. This will also work fine with SharePoint 2013 and SharePoint 2016. Here we have taken two textboxes where the user can put the site name and the site description and a submit button. On click of that, the site will get created. Here divResults will display the successfull message after the site got created successfully. Then the script code will be like below. Here in the createSite() method we are retrieving the site title and description from the textboxes and we are making the site URL by removing the space from the title. Other properties which were required to create a site, we have hardcoded inside the __metadata. The whole code we have added inside a Script editor web part inside a web part page. Once you will Save the page and the page looks like below. Here put a title for the site and a description for the site. Then click on the Submit button. It will show a successful message once the site got created successfully. You can navigate to the Site Contents page and you can see the site got created successfully.